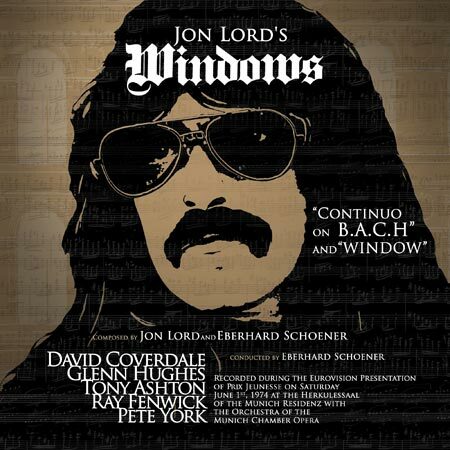 Three weeks after the new DEEP PURPLE album “inFinite” hit the stores, Edel will continue the series of Jon Lord re-releases with “Windows”, an album featuring a cooperation between Jon Lord and conductor and composer Eberhard Schoener. Schoener, who was also involved in progressive rock masterpieces like “The Turn of a Friendly Card” by The Alan Parsons Project may be best known for being the creator of the main theme for the TV series “Derrick“. “Windows” was recorded live at the Herkulessaal in Munich on June 1st 1974 as closing performance of the “Prix Jeunesse International” festival under the “Rock meets Classic” banner and was broadcasted by German TV station Bayerischer Rundfunk to a potential audience of 300 million people. The album consists of two parts, the 18 minute piece “Continuo on B.A.C.H.” and the name-giving 32 minute “Window” (without “s”), both composed by Jon Lord and Eberhard Schoener. “Continuo on B.A.C.H.” plays with the idea of continuing on “The Unfinished Fugue”, the last part of “The Art of Fugue” by Johann Sebastian Bach and features way more Jazz influences than focussing on Jon Lords hard rock background (as the two predecessors “Concerto for Group and Orchestra” and “Gemini Suite” did) using the orchestra more as soloists than using them in a more conventional rock meets classic way. The first part of “Window”, called “1st Movement – Renga”, was composed by Eberhard Schoener and starts with a more blues-like feeling featuring the voice of David Converdale, later contrasted by two sproaons, who make this part hard to enjoy in its entirety. As the name hints, the second part “2nd Movement – Gemini” recycles the vocal section from “Gemini Suite”, likely some sort of compromise because Jon Lord and Eberhard Schoener were running out of time. “Windows” was a contract work for the Bayerische Rundfunk to close the Prix Jeunesse International festival and had to be finished in time. The closing “3rd Movement – Alla Marcia: Allegro”, composed by Jon Lord reminds of “Gemini Suite” but also includes moments which would later become parts of “Sarabande”, Jon Lords next solo work. The band consited of Jon Lord on piano, organ and keyboards, his DEEP PURPLE bandmates David Coverdale and Glenn Hughes, both on vocals and Glenn also on bass, Tony Ashton on vocals and keyboard and last but not least SPENCER DAVIS GROUP members Ray Fenwick on guitar and Pete York on drums. The classical section included the Munich Chamber Opera Orchestra conducted by Eberhard Schoener, featuring sopranos Erminia Santi and Sigune von Osten, Günther Salber on violin, and finally well known actor Klaus Löwitsch as narrator. Sadly the audio recording doesn’t include the whole performance, but leaves out the “Einleitungsfanfare zu Also Sprach Zaratusthra” by Richard Strauss and all narration parts by Klaus Löwitsch without explaination. This might have been because the narration was completely in German and its content hard to guess even for native German speakers. Thanks to Youtube, there is at least a low resolution video of the whole event available for everyone to watch. While being published on LP in 1974, the first straight-to-CD-transfer of “Windows” was released 1987 by Line Records, followed by a 25th Remastered Anniversary Edition on Purple Records in 1999 and a reissue in 2010. Adding a restored version of the video recording would have been a great bonus to render the 2017 release from a nice to have album to a must-buy. Posted by andreas on Thursday, April 20th, 2017, filed under Blog. You can follow comment on this post through the RSS 2.0 feed. You can skip to the end and leave a comment. Pinging is currently not allowed. New DEEP PURPLE album name is not “Infinity”….. ! It’s name is “inFinite” …. I know it’s Jon’s hardest to digest work by far (if there is one thing you can accuse Jon of then that his classical exploits were sometimes a little safe/tame) and an ambitiously- flawed project overall, but all that said I listen to Windows more often than to either Gemini Suite or Before I Forget and almost as often as to Sarabande and Pictured Within/Beyond the Notes, it has grown on me over the decades, maybe I like the “conceptuality” of it. I’m at the point where I even dig the dreaded soprano girls! Shame that they did not use this chance for the complete thing (if added as a bonus CD), but my guess is that there are issues with the rights much as there are with the live version of Butterfly Ball. I hate narrating(synchronising it with the German, Spanish or whatever language). Once substitles were something new and special but with nowadays software it cant be hard to use it . But no , still many nations use the narrationtactic, insulting IMHO the originality of it all, the original voice of the heroes we all love. Also forgetting the much wider appeal of your product if you would have used subtitles. English has become Lingua Franca, no matter what they say.